With global warming now a widely-accepted reality, it's time to make sure that our planet's plant life is able to keep up with the rising temperatures. To drought-proof the world's greenery, scientists have been experimenting on hacking plant genes to improve water retention. 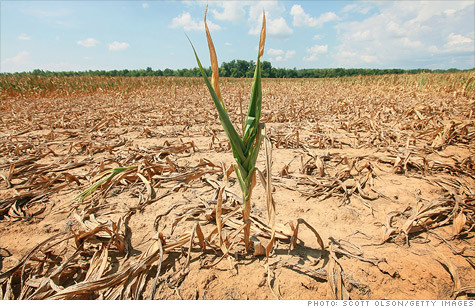 According to factor-tech.com, over 2 billion people worldwide have been affected by drought in recent years. The UN's Food And Agriculture Organization reports that over 11 million people have died from drought-related issues (crop failure or unsafe water sources due to scarcity) since 1900. Now, Duke University scientists aim to curtail that trouble, having "hacked" into plant genes to tell them when to conserve the scant amounts of water some of them are only able to obtain. The "coping methods" are triggered in the plants when their levels of calcium are raised, forcing them to process precious water more slowly. This is encoded into a gene in the plant's cell membranes. To confirm this, the scientists raised both plants with this gene and plants lacking it and studied the results. “Plants that enter drought-fighting mode quickly and then switch back to normal growth mode quickly when drought stress is gone should be able to allocate energy more efficiently toward growth,” concluded associate professor of biology Zhen-Ming Pei. This discovery will allow scientists to assess how plants in drought-afflicted areas could be made to augment their water retention and thus thrive even under difficult circumstances. If we can't fix global warming yet, at least we're working on how to deal with it. Go easy on the drinking there, buddy.